Name and ISO code : Wolof (WOL) (WOF for Gambian Wolof), alternatively called Olof by speakers, and Walaf, Oulof or Volof in some ancient publications. Speakers : probably over 5 million speakers (Wolof ethnic group) in Senegal, approximately 200 000 in Gambia and the same in Mauritania. Wolof is also used as a vehicular language in Senegal, and including the Wolof diaspora all over the world, the total amount of speakers might reach 10 million. Classification : Wolof is a Niger-Congo language belonging to the Northern branch of the Atlantic group (The existence of the Atlantic group is currently under discussion). Dialectology : language variation in Wolof is relatively weak. Local varieties have their particularities (mainly phonological and sometimes morphological), but it seems more appropriate to distinguish between varieties rather than dialects, except for the Lebu (lébou) variant spoken in the Cap-Vert peninsula of Senegal and the Petite Côte, and to a certain extent for the Wolof of Gambia. In Senegal, the Dakar variant has been gradually established as the standard contemporary Wolof, without formal recognition, because of the influence of the capital, of the radio and TV broadcastings. This urban Wolof is characterized by ‘interlarded codeswitching’ with French (for words, phrases or sentences), often criticized by purists. 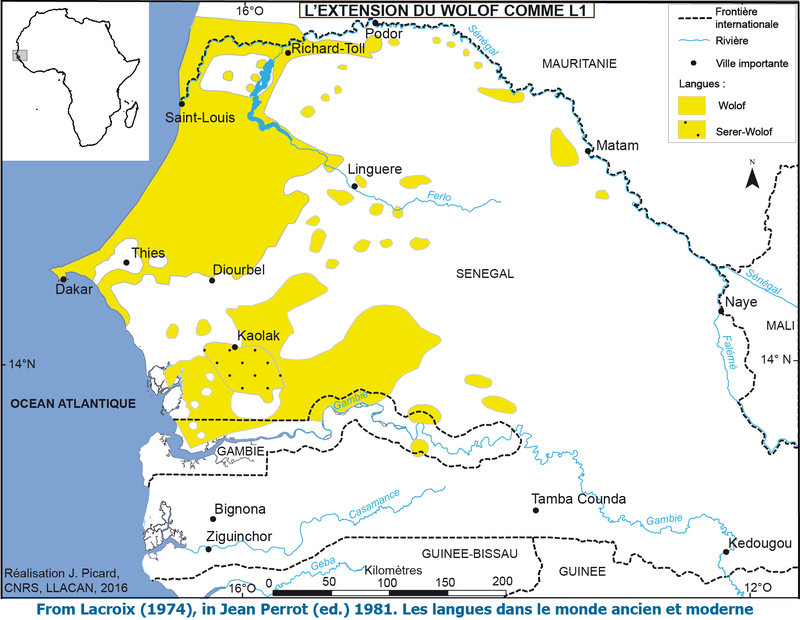 Status : Wolof is the main vernacular language of Senegal, originally spoken in the ancient kingdoms of Baol, Walo, Kaajor, Jolof, and Saalum. It is nowadays the mother-tongue of more than 40% of the inhabitants of Senegal but has also been used, for a long time, as a vehicular language (estimated to be used by 83% of the population in 1983) all over the country (except in the Eastern part), in all domains, by all ages, in particular in urban centers. Language use is vigorous and expanding, even in Casamance (southern Senegal) and the Gambia where Mandinka used to prevail as a vehicular language. Most of the speakers are at least bi-lingual (with French in Senegal, English in the Gambia), and often multilingual for those who do not belong to the Wolof ethnic group. French is the official language of Senegal but Wolof was one of the first six languages of Senegal recognized as national languages, mentioned as such in the 2001 Constitution. It received an official orthography (using Latin script) in 1971 with several corrections afterwards. However, this official orthography is seldom used by the population since Wolof is not taught in the education system. Its main function is oral (including radio and TV programs) but since the 70’s, newspapers, websites and also a written literature (mostly novels) in Wolof have developed. A non-standardized notation using Arabic script, called Wolofal, still survives mostly in religious (islamic) poetry. Main typological features : Wolof is a non tonal language with accusative alignment, no case distinction between subjects and objects (except for clitics), an SVO basic word order (excepted in the case of clitic object pronouns or complement focusing), and a simplified noun class system (class prefixes have fused with the root and the belonging of a word to a class is visible only in the noun modifier’s agreement), with 8 classes for singular and 2 for plural. The verbal system is characterized by an inflectional morphology whereby modal specifications, and, more remarkably, grammaticalized focus and polarity distinctions have fused with personal and aspectual specifications. The unmarked paradigms have a present perfective (completive) value, from which imperfective (incompletive) and pasts are derived with suffixes or by an imperfective copula. Wolof has auxiliaries with various values, and a large set of derivational affixes (mainly suffixes), including suffixes coding valency changes (e.g. applicatives, antipassive). This language has no adjectives but two classes of adverbial ideophones. A remarkable triplet of spatial deictic suffixes (proximal, distal and not localized) pervades the whole language system and is used for definite articles, demonstratives, a verbal inflection (the Presentative), as well as for subordinating conjunctions (temporal and conditional). Wolof has a simple consonant inventory including prenazalized phonemes and geminates (whose phonological status remains controversial), 8 short vowels (i, ɛ, e, ә, a, ɔ, o, u spelled i, e, é, ë, a, o, ó) and 7 long vowels (transcribed ii, ee, ée, aa, oo, óo) : the central vowel /ә/ does not have a long counterpart; /a:/ has an unusual open and abbreviated realization (transcribed à), before a group of consonants.